Christmas is . . .
seeing the wonder in a child’s eyes as he hears the Christmas story. hearing and singing age-old carols as if it were the first time. reaching out to others who need us. being content with what we have in life. spending quality time with family. realizing that the best gifts can’t be bought. keeping a bright, positive outlook in the middle of holiday frenzy. knowing what the season means to you and not what others say it should be. celebrating in your own way and not allowing what others do to color your festivities. being grateful for every small gift whether it’s a hug from a friend or a smile from a stranger. allowing peace to overtake us. Two years ago, Jo Huddleston and I decided to write a Christmas gift book expressing our feelings about the holiday season. 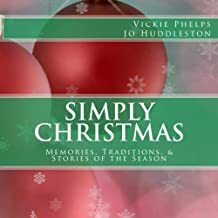 The result is “Simply Christmas.” Some of you already have a copy and know the contents, but for those of you unfamiliar with the book, I’ll be sharing tidbits from the pages from now until Christmas. The book contains stories, traditions, poems, recipes, and devotions. May it warm your heart and give you a fresh outlook on this most hectic of seasons. Melt almond bark in top boiler or microwave. Add peanut butter and swirl together. Add chocolate chips. Do not mix chips, just swirl together gently. Pour out on baking sheet or other large flat dish. Let harden, then break into pieces. Store in plastic container. Throughout the Bible we find the use of the words perfect and perfection referring to God and Jesus Christ: God is perfect, his work is perfect, his way is perfect, and God’s law is perfect. Living as we are in a world of imperfection, why wouldn’t we trust in God? Before Jesus ascended, he promised to leave the people a peace that surpassed all understanding. Now, in the Scripture above, Isaiah tells us that God will keep us in perfect peace if our mind steadfastly stays on God and we trust him. Some call the Bible God’s rule book for us. If so, we can be assured that the things he sets out for us in his Word are for our good. Scriptures tell us that, among other things, God will give us peace if we believe in him and obey him. Among other beautiful names that the prophets gave to Jesus was the Prince of Peace. Peace: a wholeness and well-being for us and our society. Peace can be ours if we trust in God. During the season when Christians commemorate Jesus’ birth would be an appropriate time to affirm or reaffirm our trust in God and claim his perfect peace. Prayer: God, thank you for your perfect peace as our blessing for trusting you.